Photographs of a den of wild dog pups on an outback station and a feral cat in the remote Western Desert took out the winning prize and people’s choice awards respectively in the Invasive Animals Cooperative Research Centre’s (IA CRC) national Feral Photos competition. The winning photo was taken in the northern Goldfields of Western Australia by Daniel Briggs. “I was out for a run on the station when I heard a yap in the scrub. I looked over and spotted a wild dog. “On my return journey I heard whimpering and investigated. could have got a better shot but didn’t fancy leaving myself exposed to mum for any longer,” Daniel said. “The people’s choice award went to Kate Crossing from Alice Springs. Kate works with the Kiwirrkurra community in Western Australia on activities like threatened species surveys and managing feral animals. “The photo is of Nolia Napangarti Ward holding a feral cat which she had just hunted. People from the Kiwirrkurra community in the Western Desert have a long tradition of hunting cats for food. Jessica Marsh, the Natural Resource Management Facilitator for the IA CRC based at the NSW Department of Primary Industries, and coordinator of the competition, said over 400 entries were received this year. animals can be to agriculture and the environment,” she said. 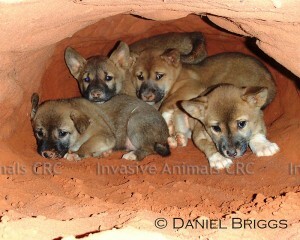 1st Place: Daniel Briggs from Victoria with a photo of ‘Wild dog pups in a den’ taken in the northern Goldfields, Western Australia. 2nd Place: Trent Scholz from South Australia with a photo of ‘Camel train’ taken in the Simpson Desert, South Australia. 3rd Place: John Jones from South Australia with a photo of ‘Flying toad’ taken in Queensland. People’s Choice: Kate Crossing from Alice Springs with a photo of ‘Nolia and the feral cat’ taken in the remote Western Desert, Western Australia. Best Remote Camera: Ian Robb from New South Wales with a photo of ‘Wedge tailed eagle and Fox’ taken in NSW. Judges gave a Highly Commended to: Queenslanders Joe Scanlan (roadside feral cat) and Neil Walker (feral cat reflection), WA’s Marika Maxwell (Feral cat with Phascogale) and NSW’s Jan Jacka (Wedge tailed eagle preying on rabbit).